I'm sitting at my desk when I get the call from my Mother in Law, she's in a panic and told her to calm down some. After a few breaths she explained that our little one shoved a bead in her nose and that she's worried because she doesn't see it in there and that she's going to have to take her to the ER. I asked her to check out the little one. First off, to assure that she can breathe fine and secondly, is she in pain. If she can breathe fine and there's no pain, and you can't see it, my guess would be that the bead went through her nose and into her mouth. She either spit it out or she swallowed it. She still seemed a little edgy so I spoke with our little one. I got her to stop crying and she explained to me that she put a bead in her nose. I spoke to grandma and I asked her to see if she can see the bead, if she can't the little one may have swallowed it, if she can see it, we may have to take her to the ER. I asked her to calm down, check again and then to call me back. My son called me back. lol He was with grandma and he told me that they are going to stop by our work place to see if I can see it. I told them OK and to call me when they get here (no more than 8 mins away). Of course, at about the 7 min mark or so, I'm called into a meeting. My boss heard the conversation I had with my mother in law earlier so he asked if everything was OK and told him what happened. He told me that if I needed to go, I can go, but considering that we were late this morning, I didn't really want to leave unless I had to. So I walk into the meeting and luckily, it's real quick, as in 2 minutes and we're done quick. I walk over to my wife's desk and she's gone. I briskly walked toward the exit and started looking for the white car my mother in law drives. It's by the post office and my wife is there checking out the situation. I walk over and take a peek and yup, there it is... A pink bead waaaaaaay up in her nose. First thought, tweezers are too thick to go in there and pull out. My wife suggested that maybe we can use something small like a paperclip. I'm thinking, I can see it... A paperclip might just do the trick and we won't have to go to the ER. DO NOT TRY THIS AT HOME, or on the SIDEWALK for that matter. I was extremely confident that the bead was in the perfect position to allow me to pull it out. I do not recommend doing it yourself. My wife sterilized a paperclip and I reclined our daughter in her car seat. The light was awful and since it was a pinkish bead, it was damn near impossible to see, since it blended with the lining of her nose. My wife calmed our little down with talks of Chuck E Cheese and I showed her that the paperclip will not hurt, that it will tickle, and I inserted it in my nose so that she didn't freak out. At first, I didn't think we would be able to do it since her reaction to the paperclip caused her to sneeze or twitch her nose a little due to the tickling sensation. After a few failed attempts, I moved her to the front seat since it had better lighting and again, we reclined her. When I peeked in her nose, I saw that the bead shifted positions from being waaaaay up there, to being kinda up there. My wife had the brilliant idea of having our little close her eyes while I worked. After a few more attempts, I got it out. WHEW!!!!! Crises averted. She seemed glad that it was out and had a huge smile across her face. The first thing my wife said was, "That's going in her baby box." lol We keep some of the kid's mementos and what not so here it is... 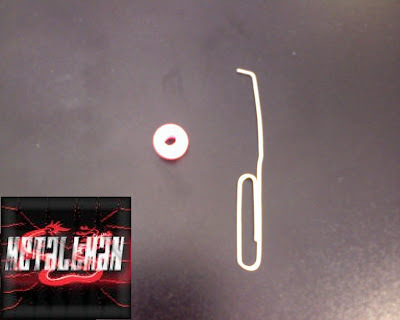 The bead and the paperclip that made it happen. I'm glad our little one is a trooper and didn't panic herself. Looks like we're on our way to Chuck E Cheese tonight. Later! We went to Chuck E Cheese last night, as promised, and our little one took this pic of herself for us. lol What a thoughtful child to kill a coin for a pic for us. Then the icing on the cake was when we got home. I sat on the couch and she comes up to me and says, "Daddy, thank you for taking the thing out of my nose." Awwwwwww. My oldest shoved a raisin up her nose. When we took her into the doc he refused to believe it, calling it 'mucus'. "It's not a booger!" my wife kept saying. In the end he took a tool and pulled it out. wouldn't you know it, a year later the kid did the exact same thing. Paging Dr. Metallman to Pediatrics...Paging Dr. Metallman to Pediatrics! Very glad to hear the bead made it out safely. I remember doing the exact same thing, except it was easily expelled. My oldest two are only 19 months apart, so back when they were toddlers, life was certainly interesting. In one week I was in the ER three times. My daughter stuck a barbie necklace bead up her nose. My son swallowed a quarter that got lodged in his throat. My daughter was given a candy stick by a neighbor, she swallowed it and it ended up sideways in her throat. Yeah, the ER knew us by sight.. Good save!